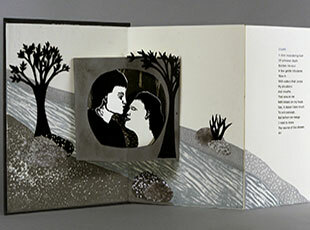 Full Plate Press: "Full Plate Press is a collaborative book arts press located in Kitsap County in Washington State. The four members of Full Plate Press have been involved in art and book making over the course of several years. "Originally, we enjoyed getting together regularly to work on our individual creative projects. Bouncing ideas off one another while creating individual projects encouraged us in the idea that we could work collaboratively on artist books that we might produce collectively. "We are indeed fortunate to be able to work collaboratively in the best sense of the word, inviting constructive criticism and suggestion from each other while being able to let our individual voices speak clearly." 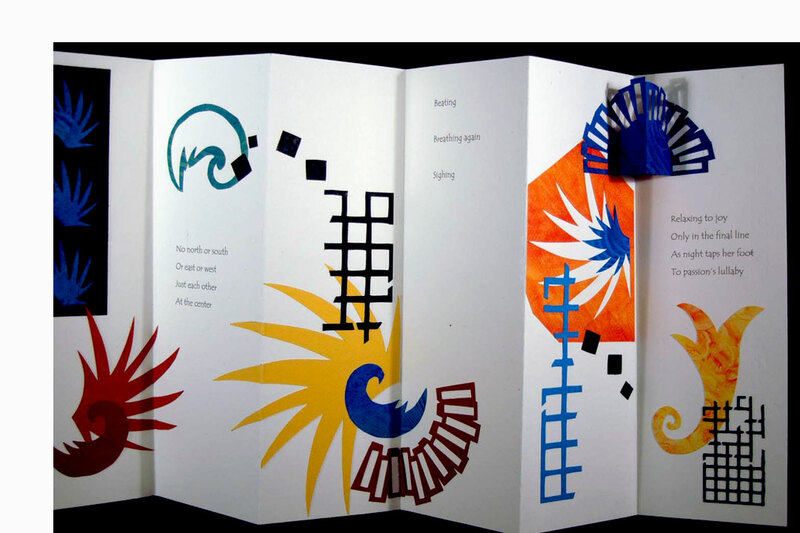 Full Plate Press, 2009: "The four members of Full Plate Press have been involved in bookmaking over the course of several years, through classes we have taken from Julie Chen, both at the Oregon College of Arts and Crafts and those we hosted on Bainbridge Island. We were all teachers on the Island, and enjoyed getting together to work on our creative projects. We were also interested in creating a studio space where classes could be taught and/or taken on book arts. Bouncing ideas off one another while creating individual projects gave us the idea that maybe we could collaborate on a single project that we might produce collectively, and for which sales might provide seed money for future projects." Kingston, Washington: Full Plate Press, 2016. Edition of 16. 6.5 x 9"; 28 pages including pastedowns. Double-sided accordion. Image pages printed relief. Fabriano Artistico Traditional White hot-press watercolor paper with a variety of colored papers used in the pop-up sections. Tahoma typeface. Bound in cloth boards. In cloth slipcase. Numbered. Includes 8 page pamphlet of Production Notes. Colophon: "Beyond Boundaries is a collection of poems and images which are reflections upon the boundaries we have encountered in our lives. Some of these boundaries are physical borders, others are internal guilts, philosophical divides, cultural differences, or emotional and intellectual edges. We have found that some boundaries, lines, or borders hold us back or contain us, while others beg to be crossed, and in crossing them we find ourselves set free of the constraints in our lives. We ask the reader to enjoy this book with an eye to examining the boundaries in his or her own life, and to ponder those things which might be changed in moving beyond his or her own boundaries." By Lynn Agnew, Robin Hruska, Susan Lange, Mary Jeanne Linford Kingston, Washington: Full Plate Press, 2014. Edition of 12. 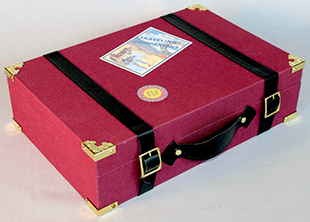 12 x 8 x 3" hinged case with buckled straps, handle, brass corner fittings, and travel stickers for title and press name. Black-patterned cloth interior with pocket in lid and black ribbon tie at base. Materials: book board, book cloth, fabric, faux leather, and brass hardware. Pocket contains: 7.5 x 4" air mail envelope with two folded 11 x 7" pages of "Production Notes" and 16 postcards varying in size from 3.75 x 7.25" to 9 x 4.75". Eighteen 6.75 x 10.5" single sheets laid in base, held in place by ribbon. "Production Notes" signed by the artists. Collaged images using drawings, decorative papers, stamps, pochoir techniques with stencils, brushes, and ink, inkjet print transfers, and photos. Collages copied onto papers then scanned and printed using an inkjet printer on Red River photo papers. Poetry set in Gisha typeface and letterpress printed on a Poco Proof Press using Fabriano Artistico Hot Press 140# paper. Numbered on the colophon. Colophon: "Traveling Companions is a collection of poems and images that come from our memory and experience of the people, places, objects, and emotions that have kept us company as we have traveled through life. Though not a complete inventory, these 16 recollections represent what we have held onto most dearly and sometimes had to let go of most painfully in our collective 240+ years of living. Manifested as postcard images and folio poems stored in a suitcase, these are souvenirs of our several lifetimes. They are meant to be viewed with the same sense of joy, sadness, longing, humor, and fun with which they were created, much as one would look at souvenirs collected along any journey." 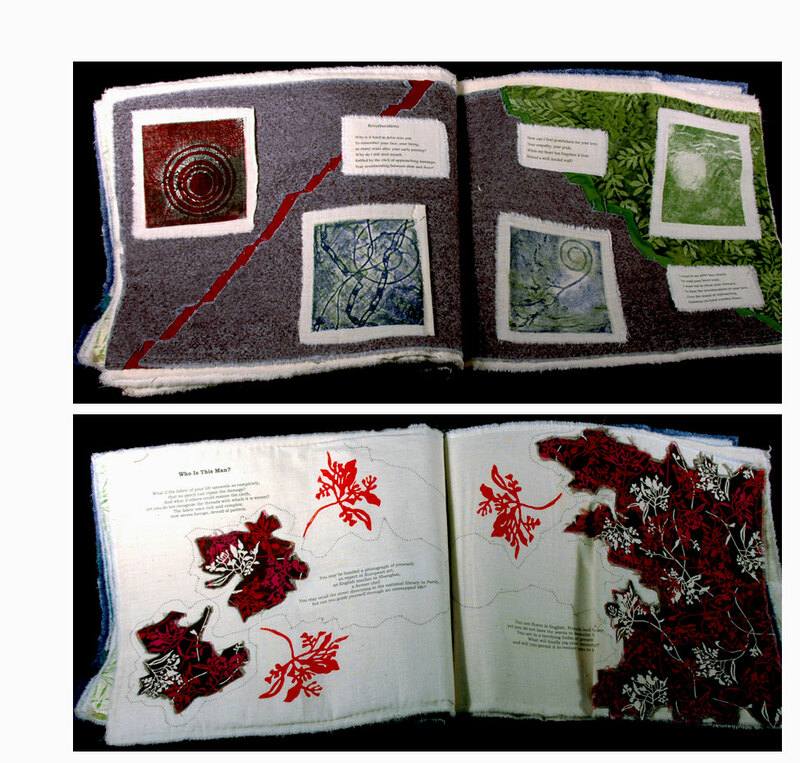 By Lynn Agnew, Robin Hruska, Susan Lange, Mary Jeanne Linford Seattle, Washington: Full Plate Press, 2011. Edition of 8. 4 x 11.25 x 1.75" custom heavy-paper case with velcro closure. The case front has a printed title label tipped on through which a small working compass protrudes. In side the case: five books, four double-sided accordion books with text and design and one single-sided accordion with production notes. Individual books bound in black paper covers with tipped on titles. 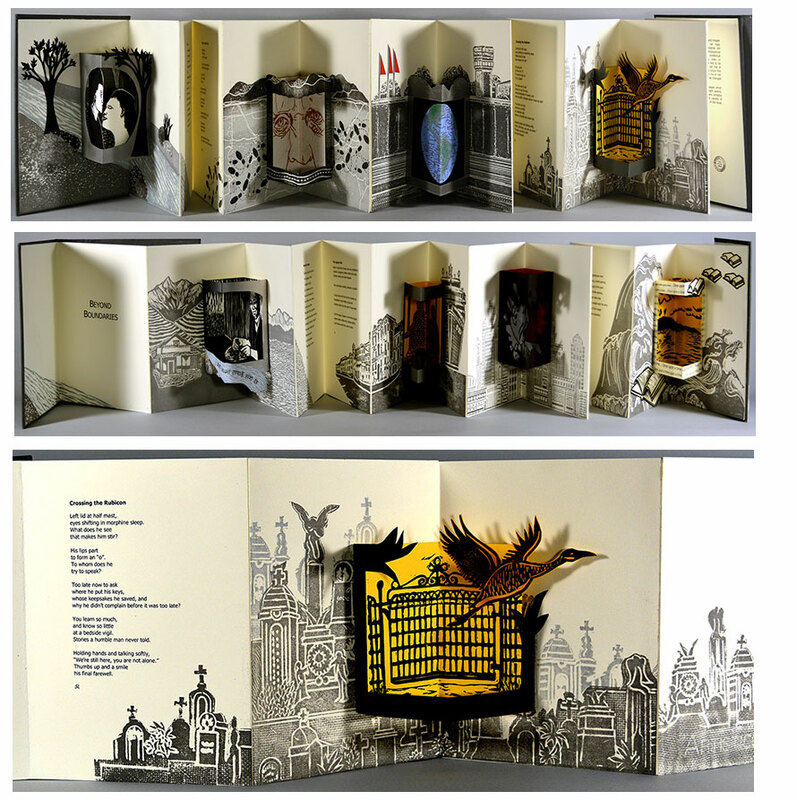 The four double-sided accordion books (Quicksilver, Einstein's Fiddle, Joy, Sing) each 3.9 x 11" with 8 pages. Test digitally printed on Fabriano Artistico paper using Tempus 16 type. 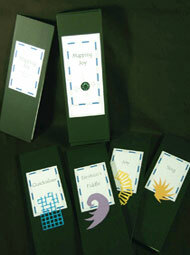 Design elements include paper cutting and collage with Canson Mi-tientes papers. Back side of accordion illustrated with simple longitude and latitude lines. Mapping Joy: Production Notes - digitally printed single-sided accordion (3.9 x 11"; 5 pages). The Production Notes detail the collaborative process. Each book in this edition is a slight variant and is designated by one of the eight main compass point (e.g. north, northeast, east ...). Full Plate Press: "We were interested in doing a 'happy book.' We did not want a saccharin sweet book, but something that spoke to the elevation of body, mind, and spirit. Joy and wonder became our target. We came up with six words and images that we copied and shared. We also wrote and shared joy journals for a month. These were journals focusing on things that brought us joy in our daily lives. Some of us bounced ideas off of friends, asking for their definition of joy and/or wonder, and how it was expressed in their lives." Seattle, Washington: Full Plate Press, 2010. Edition of 12. 16 x 13.75 x 1.75"; 28 pages. Textile Book. Sewing. Original collograph printing plates were created and then printed with oil-based ink on muslin. Images, text, and fabrics were hand- and machine-applied to unbleached muslin pages. Text was transferred to the pages with a variety of techniques including iron-on transfer paper, rubber stamps, and direct printing. Cotton fabrics, trim, notions and embroidery further embellish the pages. The interior of the pages were stabilized by interfacing, and the entire book was bound in a soft cover. 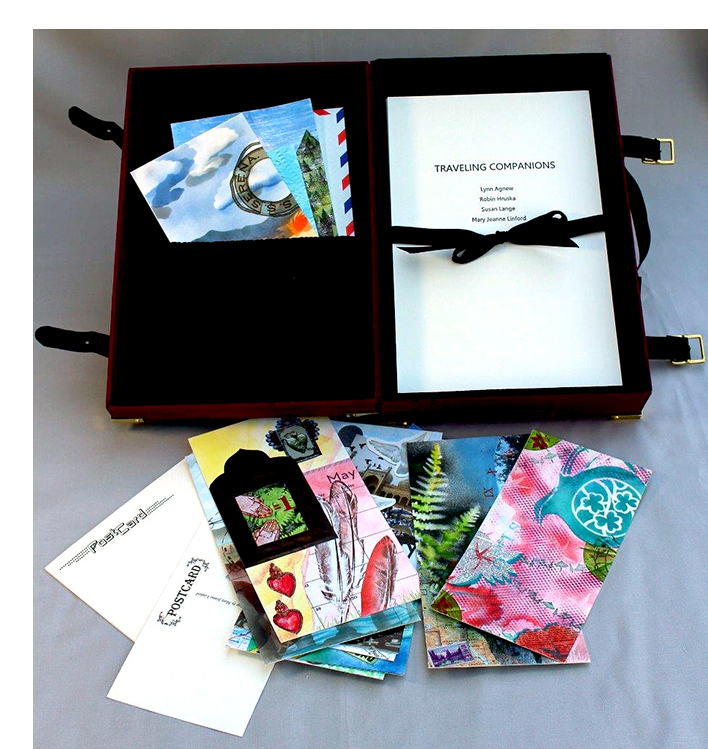 The protective case is constructed of book board and cotton fabrics. Housed in handsewn cloth envelope with button clasp with title sewn in. Full Plate Press: "A collaborative exploration of the words ravel and unravel, which are opposites but have the same meaning. We explored this conundrum within the context of our own lives and the lives of others. We chose fabric as a medium because it lent itself well to our subject, and the tactile and visual qualities of fabric appealed to us." A wealth of technique, imagination, and inventiveness. The fabric swaddles and softens the edges of lived lives offered in short tales of joy, loss, and transcendence. 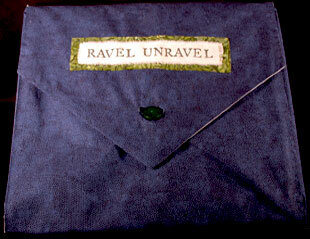 Ravel/Unravel is rich and fulfilling visually and spiritually. It is one of those books that haunts and comforts. Listen, Can You Hear Me? Seattle, Washington: Full Plate Press, 2009. Edition of 8. 9.25 x 10.5 x 1.875"; 50 leaves. Modified flag binding with concertina and tri-fold pages. Inkjet printed on Fabriano Artistico using an Epson printer. Original intaglio prints, made during a printmaking residency at Centrum in Port Townsend, Washington, using a photo-etching process, are here reproduced on Arches Cover Traditional using a laser printer. Bound in cloth with grosgrain ribbon pull. Slipcased. Full Plate Press: "Listen, Can You Hear Me is a collaborative work by four women working under the press name Full Plate Press. 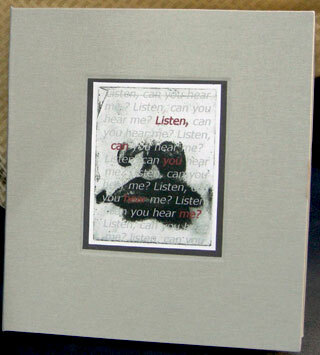 Poetry and intaglio prints explore the issues surrounding listening, hearing, and hearing loss. "This topic struck close to home, as two members are dealing with hearing loss, one member has a deaf step-daughter, and as teachers, all have dealt with students with varying degrees of auditory processing problems. In addition, they all have experienced difficulty being heard as women. The resulting book looks at the many sides of hearing and hearing loss, incorporating humor, emotional response and commentary." "You said, 'There's a new dent in the car.' I wondered what possessed you to buy a new tent?"